To lead the fight against Satan. To be the champion of God’s people, the Jews of the Old Testament, the Christians in the New Testament. To lead away from earth and bring men’s souls to judgement. 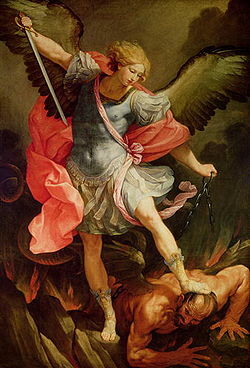 The three archangels who were sent to man to proclaim wondrous messages, or defend mankind against the wickedness of the devil: Michael, whose name means ‘Who is like God?’ which was the war cry of the angels, lead by Michael who cast Satan and his followers out of Heaven. He is especially honoured and invoked as a protector by the Church throughout history.